This section of the website documents the projects which Iain has had the opportunity to research, propose, develop and collaborate on while working at Gray's School of Art. Working in an academic environment has allowed Iain the freedom to create a range of innovative projects for the use of the Students and Staff which he would never have had opportunity to do in industry. He finds this area of his practice can be the most fulfilling as he continues to challenge himself to use his commercial experience and design skills to help students and staff at Gray's in new and innovative ways. Please Note: All images and text on this page are the copy write of Gray's School of Art, Robert Gordon University and can not be reproduced without permission. A paper I have submitted to the above conference has been accepted and I will be presenting it in June 2017. The paper builds on some of the changes I have made in Stage 1 Communication design earlier in the academic year. "Gray’s School of Art is investing in the latest technologies through it’s city centre based ‘MAKE Aberdeen’, a Digital Fabrication Studio. This new initiative aims to integrate the latest technologies with studio based projects, which will allow Design students to work in innovative ways to widen their design knowledge as well as giving them a range of invaluable skills that will underpin their subsequent years of study and eventual transition towards professional practice. The school’s long-term goal is to ensure our students are ready to work in industry in an ever-evolving market place. This is underpinned by the school’s Personal Professional Development program that was established with student partners, which compliments the students’ studio practice preparing them for employment or postgraduate study. Although the project is in its early stages, keeping in touch with our graduates is key to understanding current requirements within the design sector, and informs how the project will develop over the coming years." x Having taken over as Stage 1 Co-ordinator for Communication Design in 2016/17 I decided to update some of the projects to use new technologies available in the city to compliment the range of tradtional hand on skills covered on the course. One of the projects for semester one tasked the students with investigating their own individual identity as well as thinking of their connection with a wider understanding of visual culture. This four-week project also allowed the students to work with MAKE Aberdeen, the first Digital Fabrication Studio in the City students learned to scan themselves, edit the files and then out put 3D digital models of them selves as part of the project. The 50 3D models and supporting material were then exhibited in Hatch, a new creative industries graduate enterprise and incubator space in Aberdeen City centre which had been set up by recent graduates of the course. The exhibition provided the students with their first experience of exhibiting their work to the public and proved to be a great success with newspaper and TV coverage. As part of my new role at Gray's as a Learning Enhancement Co-ordinator I have been asked to develop PPD in the school to help students to critically reflect on their learning and actively engage in their personal development. Eleven 'Student Partners' were selected to work as part of a student / staff team to review PPD related themes and tasks that could be developed for the school. This led to development of a pilot year for the projects where we would promote new ways to look at PPD and document it through My Portfolio pages while also supporting existing PPD development already grounded in course material across the school. 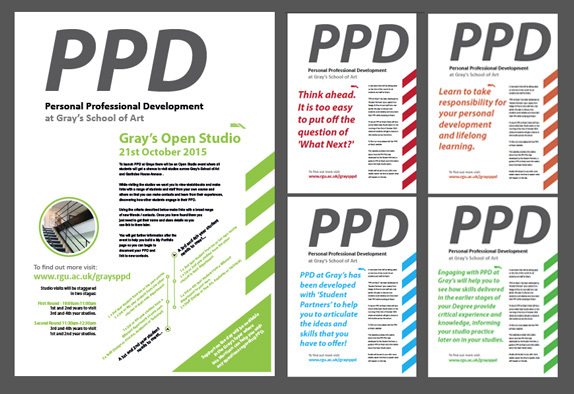 To launch PPD at Gray's there was a Studio Open Day on the morning of the 21st of October 2015 where all students got a chance to visit studios across the school and departments. While visiting studios they were asked to make links with a range of students and staff from their own course and others so that they could learn from their experiences as well as discover how their peers engaged in their own PPD. This material and links will then be documented on a My Portfolio page which is the second stage of the pilot taking place in early 2016. Further to my submission to the RGU Learning and Teaching Conference 2015, I was surprised and honoured to be awarded the prize for 'Best Paper' for my submission called ‘Old(ish) Dog, New Tricks: Developing and Disseminating Software Skills’. The RGU Nexas Online magazine stated: "Using reflection as a means to redefining his pedagogy, Iain evaluated his own 20 year practice for his paper and identified a potential gap in the ‘tried and tested’ ways of teaching and learning, and sought to acquire a renewed approach using education theory to inform practice." Prof. Ken Russell, Mark Zarb, Iain Morrison and Hilaire Graham, Head of Teaching Futures at DELTA. It was recomened that my review of software training at Gray's School of Art metioned below would make a good paper for submission to a conference so I submitted an abstract to the RGU Learning and Teaching Conference 2015, which was looking at the theme of engaging and motivating students in learning / teaching and supporting learning. My paper "Old(ish) dog, new tricks: Developing and disseminating software skills whilst making it both accessible & stimulating." was accepted and I presented my work at the conference which was very exciting as it was the first conference Ive taken part in. It was also really enjoyable to see the other talks happening through the day and I gained alot of new ideas from seeing the presenations by the other speakers. As a result of on going continued professional development I completed a FHEA qualification in 2004. The skills learned through taking an online Open University course made me realize that I could use the facilities and my teaching time in Gray’s in a more effective way. I presented a proposal of how I would do this to Senior team and Stage 1 staff, highlighting the changes that I would like to implement and gained backing and funding to proceed with the idea in Semester 1 of 2014/5 mainly focusing on Stage 1 Design and Stage 3 Communication design. Firstly, I wanted Stage 1 students to have a clear understanding that they have to take ownership of their learning and the application of software training. This would be facilitated through self-directed study, which should continue throughout their four years of study providing them with a foundation and more confidence in their own practice. The curriculum was delivered over eight weeks using a range of training materials with the learning being reinforced and underpinned in the studio environment through demonstrations of various software skills within the context of their own work. The second area that I wanted to consider was the use of ‘inclusive teaching methods’ for Stage 3 students which would tailor the curriculum and could make lessons more accessible for beginners whilst challenging more advanced students. This would be achieved by implementing a range of online tools, the creative use of project based lesson plans and the deeper integration of my own commercial experience to inform and guide the student’s learning. Student feedback thus far appears to highlight and reinforce the view that they have gained a better understanding of the value between studio and software practice and the application of digital visualisation techniques within their work. The ‘Innovate to Stimulate’ conference was held at the Robert Gordon University on the 9 May 2014. The programme of the conference covered keynote lectures, paper sessions, posters and workshops. Iain worked with three academics from Gray’s School of Art to create a set of posters for the conference, which visualised their research projects. All of the posters were displayed as part of an exhibition at the conference to present the staffs research projects. The poster investigated how the students have learned new design skills while working on the project. The poster also provided statistical information to show how successful Streetsport events have been over the last eight years. This poster investigated the potential of VLEs to facilitate a role for the voice in oral (Mp3) CCS coursework. This poster presented the student work that has been associated with the event over the last three years while discussing how it has led to further commissions and prizes for the department. This project is still in it's early stages of development. Having taken part in school open days Iain investigated ways for Gray's to contact future applicants before they visited so that they could get a more in-depth experience of study at Gray's. He hoped that this would help applicants to make a more informed choice if they chose to apply to study at the art school. Online training resources known as 'Moocs' were becoming popular in the USA and the UK. With this in mind Iain proposed a concept for the marketing and promotion of the school through a 'Moocs' site that would provide a small taster of some of the courses and events that can take place at Gray's. Initial feedback has been very positive and the project is currently being developed further within Gray's. The 'Core Creative Skills' project was developed from conversations with students regarding various aspects of the design process and how it differs between academic and commercial points of view. These queries often arose in the middle of a class so Iain has developed this teaching resource to be quick to access and use on the classroom projections screens stimulating further discussion within the whole class when questions arise. This online resource breaks the design process down into simple sections, which provide information graphics and guides to each entry in a purpose built page on Moodle. The main sections covered are Creative Thinking, Research, Development, Visualisation, Composition & Layout, Typography, Colour and Presentation. By providing this teaching material, alongside further group discussion and investigation by the students, Iain hopes it will help to develop their projects with more critical and in-depth levels of rigor and investigation while gaining a clearer vision of were their work sits in an academic and commercial context. This project was initially developed from a I.T. training website that Iain created in 2004. As it grew in size it soon become cumbersome to administrate. After the launch of RGU's Moodle server, Iain started to develop a new support site for Gray's that would be easy to navigate yet could contain a large amount of information. The senior team at Gray’s School of Art supported Iain's ideas for the site by providing funding and time out from his normal duties and the site was developed over the period of two years. Gray's Moodle Zone currently provides a central resource of information for all students and staff and uses a mixture of video and downloadable support files to assist students with a broad range of subjects from software training to student placements. Professor Ferdinand von Prondzynski, Principal of Robert Gordon University, commended the project and invited Iain to present the Moodle site to the board of governors as an example of best practice within the University. In 2009 Iain's started a part-time Masters project investigating the visual history of Crathes Castle, near Banchory in Aberdeenshire. Iain's research documented chronologically over four hundred visual images and references of Crathes Castle dating from when it was built to the current day. This data was then presented through the visual outcomes of 3D timelines, information graphics, time lapse movies, books and portraits of staff. In doing this Iain created a body of work which was not only of academic value but will also serve as a permanent visual record for the public of one of the North East’s most important historical buildings. The information graphic called "Construction" won the ﻿National Trust for Scotland’s Emerging Artist Award in 2010﻿ and went on to be used in publications and promotional material by the National Trust for Scotland. The Imaginal Regions symposium was a three-day event, funded by the Arts and Humanities Research Board and The Robert Gordon University. Seven speakers presented their research papers at the conference and on the website created by Iain. Iain was also asked to interpret the practice-led research creating a series of visuals for the symposium for some of the speakers. These illustrations featured in papers presented at the conference. Iain was invited to join a team of staff at Gray's to work on a research project called TACTiCS which lead to him being seconded for a year to work on the project. TACTiCS was a unique CD and web based resource that was developed to support contemporary craft designer-makers to explore and apply computer-driven technology into their practice. Iain worked as designer and developer for the project and was also featured as one of the four case studies discussing his use of the internet to promote his landscape photography. The case studies resource allowed designer-makers who were beginning to investigate the possibilities of computer-driven technology, to evaluate its potential for their own practice. Each case study provided a real life example of how individual makers have integrated a variety of key computer-driven technologies into their practice. TACTiCS was jointly funded by The Robert Gordon University and the European Social Fund, in partnership with Applied Arts Scotland and Scottish Enterprise. Having obtained funding through Alt-w, an initiative set up to support and promote Scottish-based creative entrepreneurial talent, Iain worked with Historic Scotland to produce a multimedia project titled 'Stronghold' which featured twelve interactive landscapes featuring four of Historic Scotland's castles located across the country. With the help and guidance from Historic Scotland the castles were carefully selected chronologically to show the development and changes in design of these buildings through history. The interactive images provided the viewer with a immersive experience combining movement and sound to create an image that suggested depth of field in a web based photograph. Alt-w, is an initiative set up to support and promote Scottish-based creative entrepreneurial talent and innovative online digital productions. The Degree Show is an annual highlight in the art school's calendar, showcasing the work of Gray's School of Arts graduating students. Iain developed and created the Degree Show website from 1997 - 2009 for Gray's School of Art. The earliest of these was one of the first Degree Show websites in Scotland, if not the UK and was accompanied by a live video feed on the opening night between Gray's and an Internet Cafe in Aberdeen city center using the latest fiber optic technologies of the time, sponsored by British Telecommunications. In the years that followed Iain continued to experiment and expand his web building skills and the websites developed with the evolution of web technologies at the time. The degree show websites often reflected the latest developments such as using Macromedia Flash or video and sound to present exciting and innovative web content. This was balanced with using imagery from students to style the sites which could also allow easy access to home users still working with slow dial up connections common at the time.